For this, David’s second solo record, he has again teamed up with his close friend and musical mentor, the multi-talented Ken Whiteley. David wanted to delve into the musical realms which have always inspired him the most; fifties-style small group gospel ensembles such as The Swan Silvertones and the early Staple Singers; the slide-washed folk blues of Muddy Waters; the deep spirited warmth of sixties soul and Van Morrison. But anything done at this period of David’s life would have to reflect the years of musical experimentation and life experience (fatherhood, etc.) he’s accumilated recently. This is why some of the arrangements and lyrical content on “The Spell I Was Under” might seem eccentric. “Have No Fear”, for example, co-written with Broken Social Scene’s Andrew Whiteman and filmmaker Avi Lewis, is the setting of a four stanza lullaby- poem. Accompanied by a Salvation Army-style Band, it depicts the existential angst of small children on the virge of sleep. “Be Not Broken” a hymn to temporary blissful ignorance, has an off-centre string trio arrangement. Most of the record is centred around a deep groove, and this has been accomplished by utilizing the stellar rhythm section of Bucky Berger (Rough Trade), drums and George Kohler (Holly Cole, Shuffle Demons), bass. Horns were handled by Sarah McElchran (Hawksley Workman, Leroy Sibbles), trumpet and Colleen Allen (Ron Sexmith, Molly Johnson), saxes. Piano legend Richard Bell (Janis Joplin, The Band) lent his awesome talents and Ken Whiteley Played a multitude of instruments, including Dobro, banjo, mandicello, vibes and organ. The singing, probably the most important sonic element of the record was augmented by the sensational team of Rebecca Campbell, Amoy Levy, Ciceal Levy and Pat Patrick. The keystone track of the record, “Wonder”, was written for David’s first son, Yoshi. It is a rolling New Orleans shouter all about the joys of shameless regression. 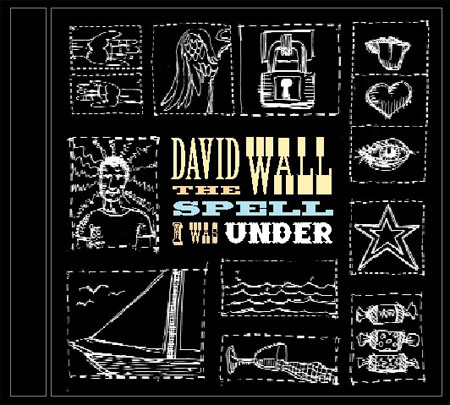 In many ways it sums up both the sound (lots of vocals high in the mix, soulful guitars, piano and horns) and the sentiment of “The Spell I Was Under”. In these troubled days, getting back to a place of sweet childish wonderment seems more and more necessary all the time.